the shortcomings of the interwebz | emmy kay and co. The interwebz is a great tool for communicating sight and sound. The girls at 2 weeks. 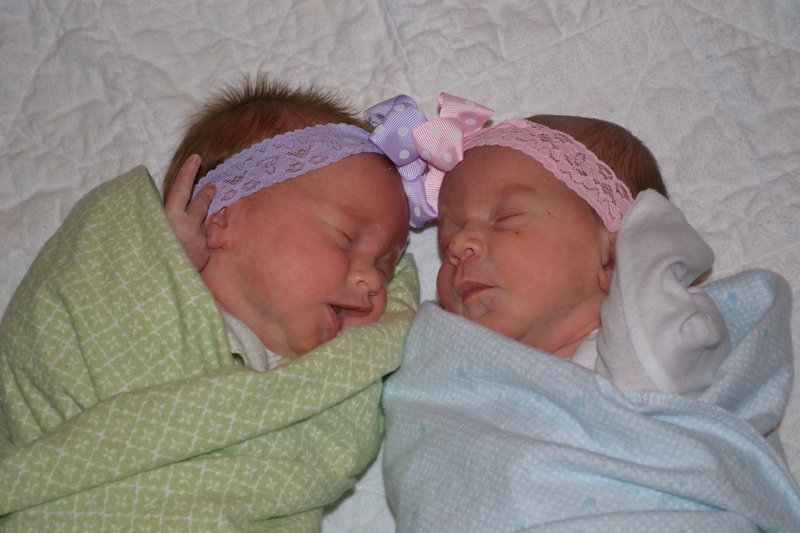 You can see our twins and observe how cute they are (I’m biased, I know). You could hear the twins, too. If I was cruel, I would record all of the twins grunting and crying so that you could enjoy their vocal stylings. But I am not cruel. But, oh, how sad I am that the interwebz is not a great tool for sharing smells. Frank bathed the girls tonight and put on some yummy nighttime lotion on their tummies and legs. He brought them down to me, all fresh and swaddled and smelling like delicious little babies. And I thought, I wish I could post this glorious fragrance on Facebook. People would check my status just to enjoy it. Alas, I cannot post smells on Facebook. Although, it’s better this way. While my girls smell fantastic right now, these young ladies can toot with the best of ’em. Toots are not something that you would probably enjoy smelling as my Facebook status.